BATON ROUGE – A nearly $600 million reduction in spending for Louisiana state colleges would leave no institution safe. That’s the message Joseph Rallo, commissioner of higher education, left Wednesday with members of the House Appropriations Committee. The Jindal administration’s budget proposal reduces higher education’s state general fund by $226.4 million (31.1 percent), and relies on $372 million in supplementary revenue of tax credits. Without these funds, higher ed’s state general fund is reduced by 82.2 percent or $598.5 million. Rallo said the governor’s executive budget provides $123.6 million in base funds to distribute among all institutions in the state’s four systems of higher ed — Louisiana Community and Technical College System, LSU System, Southern University System and University of Louisiana System. “If the $123 million stands … several of our institutions would not be viable,” Rallo told state representatives. He said that would lead to conversations about consolidating schools, although he would not say which ones. He said he is concerned about all institutions in the four systems. “No system, no institution would be safe from having to take action,” Rallo said. Other potential impacts of cuts of this magnitude include reduced program availability, reduced services, layoffs or furloughs, elimination of departments or programs and campus closures. Slashed budgets translate not only into the loss of current faculty but also more difficulty in recruiting and retaining faculty, especially at the tenure-level. Cuts also are made to support staff like counselors or student life staff, which Rallo said “accelerates the inability of students to get through a college environment” and affects graduation rates. He said institutions already are doing more with less, having seen budgets cut dramatically over the past five years. But an 82-percent cut “all of a sudden” is not as manageable as past incremental cuts. “I defy anyone to say they can just manage (that),” Rallo said. While drastically cutting higher ed, the executive budget fully funds the Taylor Opportunity Program for Students (TOPS) by replacing one-time statutory dedication money ($24.2 million) and adding to the state general fund for a net increase of $34 million. Rep. Patricia Smith, D-East Baton Rouge Parish, criticized that gap in the budget. These cuts, unmitigated, also could mean higher tuition and fees to make up the revenue, a trend that already exists. “Our students are paying more of the bill,” Rallo said. In fact, the executive budget includes $70 million of fees and tuition increases, but the Louisiana Board of Regents estimates only about half of that actually will be raised. Higher education leaders also expressed concern about pricing themselves out of the market and adversely affecting recruitment and retention of students by increasing tuition and fees. 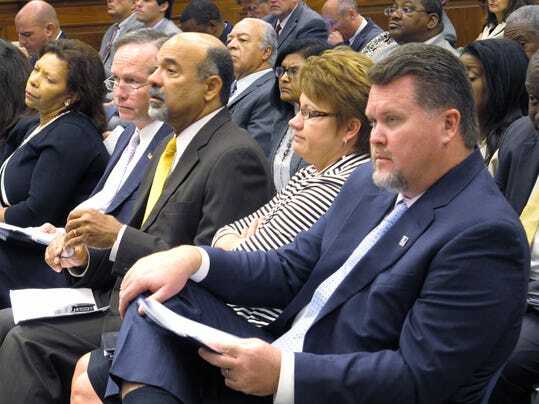 “A lack of resources and reduction in resources over the last eight years, and maybe more importantly, the uncertainty of those resources each year have affected our ability to educate students,” University of Louisiana System President Sandra Woodley said. “We want to do better in our performance and in producing a Louisiana workforce and increasing graduation rates,” Woodley said. President Ronald Mason Jr. said the Southern University and A&M College System has lost 200 faculty members and almost 400 staff members over the last few years due to cuts. He said its flagship, Southern University in Baton Rouge, still struggles with a deficit. LSU System President F. King Alexander echoed that sentiment. He said maintaining current funding levels is “absolutely vital” to the LSU System’s future. The education leaders asked for autonomy and authority to price tuition for different programs and schools in response to their markets. Alexander said they want to be able to compete when it comes to pricing. He said this change could provide $25 million to $30 million in revenue to the LSU System. That would not be the case for the UL System, although Woodley supports the push for autonomy. “Autonomy would be good for flexibility, but it won’t really solve our budget problems,” she said. Woodley said she wants universities to be able to set market rates that “make sense” at those schools, which could mean lower tuition rates. Some representatives seemed to favor the move. “I support giving you all the autonomy you need,” Edward “Ted” James, D-East Baton Rouge Parish, told the system presidents. Jim Henderson, president of Northwestern State University in Natchitoches, attended the meeting but did not address the committee. He said the school received about $48 million in state support in 2009, which has since dropped to about $20 million. Current projections in the executive budget would reduce that figure to about $6 million at NSU. He supports the push for pricing autonomy to operate universities more like a business, which he said already is expected. He said NSU would fare well with that. “We would compete very well in that kind of environment,” Henderson said. The meeting Wednesday marked the beginning of a lengthy process that will play out during this year’s legislative session. Several committee members voiced concern for the education systems and echoed the importance of mitigating cuts as possible. “We’re going to do what we can and fund what we can,” said Patrick Connick, R-Jefferson Parish.